For a long while, I was never quite convinced with PR. It just seemed to me that conflicting ideas operating ‘collectively’ under one government was bound for disaster. The stubbornness of British political parties, albeit before recent leadership elections, was shown through their desperate desire to completely disassociate from one another, while realistically not offering much different. I guess I was just lead down a path of ‘strong, single party’ governments being the most efficient and effective, while PR was portrayed as a death wish for the Westminster system. The recent coalition government appeared to be a Tory majority with a few Lib Dems awkwardly making up the numbers, but still, a stable government despite a few tears along the way. The thought of Caroline Lucas and Nigel Farage having to form consensus on certain policies or issues really doesn’t have quite the same tone to it. But, I’ll quite happily admit that my position on such an issue has drastically changed. It can’t go unnoticed that, despite the differences between the government and majority opposition, the internal conflicts of the Conservative and Labour are having a damaging impact for both. The words “party unity” seem a distant desire for both concerned, quite how John McDonnell and Liz Kendall both seem to represent the same party is completely beyond me. It not only damages the image of the party but holds drastic effect on the people. With one man spouting one thing and the next another, it really doesn’t sit well when Joe Blogs is trying to find a voice and a party that effectively represent his views. It is certainly a contributing factor, in an age where politics and the workings of parliament is easily accessible, to the severe decline in trust, interest and engagement with politics. The daunting prospect of even trying to consider whether a party provides you with a voice must drive many away. The two-party system maintained under the First Past the Post system is outdated and bygone in a time where ‘the establishment’ is finding fractures within it’s own composition. Enter proportional representation. An idea that strikes intense fear into many, namely the Westminster establishment, with it’s ‘unstable’ and ‘precarious’ nature which will ultimately results the collapse and demolition of British politics as we know it. I’m not sure how the Germans cope with theirs. We could have had a version of it after the 2011 AV referendum, but of course, David Cameron brought his special weapon to the debate: scaremongering. Thus, we are left with a generational mandate that opted to maintain the current electoral system, and I really do think that isn’t a very good thing. Yes, I could go on about how “37% isn’t a majority of the people!” and yes, I’d be right. But there is certainly more to it than increasing the value of an individual’s vote. It’s about bringing the people back into the political realm, and allowing them to understand they do have a voice, and one which they feel effectively represents them, rather than just a compromise. 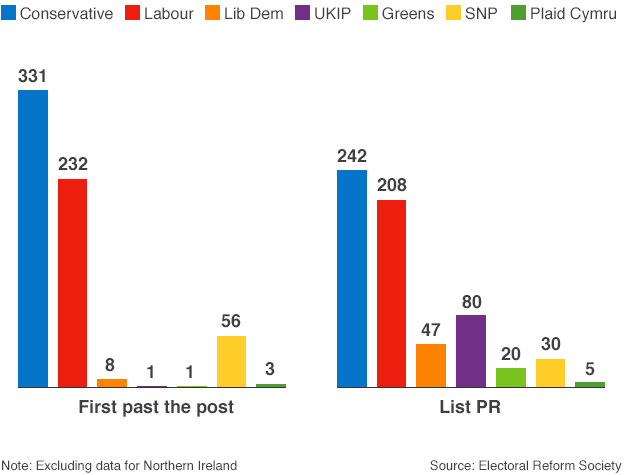 It is time for the Conservative Party and the Labour Party to split their forces and adopt PR electoral system. Let’s do something for the good of our democracy, we are so good at playing down the importance of it. Political participation is at crisis, but it doesn’t suit the establishment to change a system that works so well for them. PR will provide a voice for all those wavering politicians, but also a more effective platform of participation by the people. Let the Thatcherites do their thing and the Ken Clarke’s of the Tories go their seperate ways. Lets give the Blairite’s a platform, while maintaining the revival of the ‘Old Labour’ way under Jeremy Corbyn. A more open, accessible political system gives the people their responsibility to act and participate once again. In an age of a multi-party democracy, we are denying the people such freedom to participate by diluting their choice. A voter shouldn’t be forced to settle for Labour because only they have a realistic chance of attaining seats, give them the freedom to endorse the Greens or even UKIP if they believe that party is the platform for their opinion. I can’t predict the outcome of Theresa May's Brexit floundering, nor can I predict the future of Jeremy Corbyn’s leadership with a parliamentary party that offers little support. But what is certain is that the current system is ostracising many from political debate via a party platform and disenfranchising voters from engaging with decisions that affect them. Turnout and participation has decreased drastically since the withering of the two party system and slow uprising of alternatives at the polling booth. A system that is unfairly weighted against the emergence of these new platforms and parties does little to help the cause. Proportional representation is thoroughly democratic, and will aid the engagement of the people within the political realm. A drastic move, yes, but one which must be taken in the interest of the people and the state of our democracy, not in the interests of the established parties of the Westminster system.